According to the SmartMoney, nearly 144 million consumers watch videos online. A recent experiment by WalletPop revealed that “for the price Americans pay for cable TV, they can enjoy a mini-vacation.” Just how much are we spending for the convenience of cable? Comcast, for instance, costs about $552 a year – and that’s just basic service; premium packages run more than $1,200 annually. If you’re looking for alternative ways to catch your favorite shows and movies without having to take out a second mortgage or find another roommate, consider these suggestions. Sites like ABC.com, NBC.com, and CBS.com are perfect for watching the shows you missed the night before. Shows are usually available the morning after they originally aired, so you can catch up on your lunch break or when there’s nothing else on that you want to watch. I became a convert a couple years ago when “Lost” was still in new episodes. I had kickball on the night that it aired, which forced me to miss it. Luckily I didn’t have to wait too long to get my fix. ABC has an excellent app that mimics its website; the content is free and available the morning after a show originally airs. The downside is that ABC is really the only network with an app like this. HBO just launched an app, but you have to be a cable subscriber, which totally defeats the purpose of cutting the cable. Hopefully the basic networks will follow suit and the cable networks will offer a la carte options to purchase pay-as-you-go content on mobile devices. Hulu has a similar premise as the individual network sites, except it consists of several networks providing content so you can watch many of your favorite shows in one place. One of the best things about Hulu that I’ve found is that you can set subscriptions for some of your favorite programs. When they’re available to view, you’ll receive an e-mail letting you know. If you want even more content, you can purchase Hulu Plus, an advanced service that allows you to access content on mobile devices, but frankly I think it’s a waste of money considering that most of the TV content it has is available for free on the respective network sites. I canceled my DVDs-in-the-mail subscription last year because the selection was lacking. I had either seen the available movies in the theater or they weren’t available upon regular release because the kiosks got them first. I still have Netflix streaming, however. 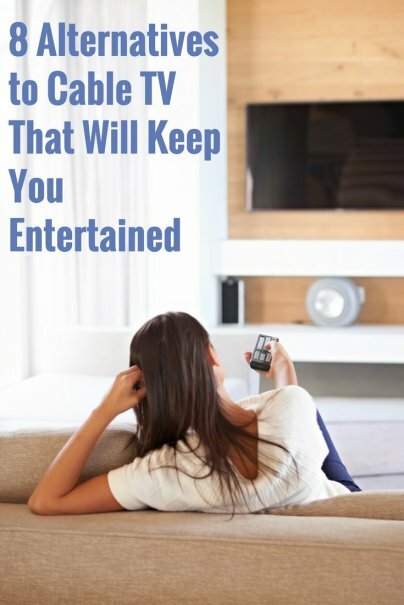 It’s great for a rainy day, or when you want to watch content from your iPhone or iPad. A monthly subscription for unlimited streaming — there’s no extra charge for your hand-held devices — is only $7.99. Directly competing with Netflix in the unlimited-streaming category, Amazon recently launched its own streaming option that includes over 5,000 commercial-free movies and TV shows available with an Amazon Prime membership, about $79 a year. When you do the math, it’s cheaper than Netflix streaming, but the selection isn’t as robust. In fact, Amazon has less than half the titles that Netflix boasts. Still, that’s a pretty good selection. A total game changer for the cutting-the-cable argument, Warpia StreamHD ($169.99) allows users to wirelessly stream anything on a laptop or PC to the flatscreen. The USB-based device mirrors the computer screen without the mess of cords. The transmission shows up on the TV in 1080p resolution and 5.1 surround sound. The package comes with all the bells and whistles, including an HDMI cable and SPDIF cable. Warpia is compatible with Windows 7, Vista SP2, and XP SP3. Many of my friends have converted to Apple TV, and they rave about it. The box, which costs $99 with free shipping from Apple.com, gives you access to iTunes’ impressive library of titles, which vary in price; new-release HD movies are $4.99, SD movies are $3.99, and TV shows are $0.99. The box is also compatible with Netflix, and it allows users to stream content directly from their Mac or PC to the TV screen. Have you cut the cable? How are you saving money on media content? Let me know in the comments section below. I had a question: I've considered cutting cable for months now. I pay $120 for cable and internet, not fun. Some of these channels aren't on basic so I have to pay extra for that! I looked online to find these channels, but to no avail. Maybe I'm not looking in the right places. I like Food Network, Cooking Channel, Travel Channel, NatGeo, Science Channel, Logo. Maybe someone has a suggestion? i'm in the same boat as Danielle! I pay $115 a month for cable and internet. Love food network, bravo, E! and some kids channels. help! If it makes you feel better about the Blockbuster kiosks, they're actually owned and operated by NCR. They only use the Blockbuster name on the kiosks because consumers are familiar with it as a movie rental company. That does make me feel better. But what's NCR? National Cash Register, the same people who make the cash registers that eat all of our money. You forgot the library! Free books, music, movies, classes, seminars and exhibits! How could you forget the library??? Yes! The local Public Library! My library has a fantastic selection of newly released DVDs. While I must sometimes wait for the titles I want, I can set up a list of titles, freeze the requests until I'm ready for them and watch for free (unless I return them late). Most libraries also carry CDs and downloadable eAudiobooks and eBooks, not to mention books. Might want to check out Roku. It is similar to Apple TV, it lets you connect to your Wireless network (the high end unit) and then access your Netflix, Pandora, Amazon Prime Videos, Hulu, plus lots of other channels you can download. It also lets outside organizations create a private channel you can add, like BYUTV. I just got mine on Monday, I just might be dropping cable TV from Jan-Aug, have to have my HDESPN for Football season. Another thumbs up for Roku + Netflix. Had the combo for several months now and the family loves it. i was just going to say roku. i love mine so much i buy them as gifts for friends and family. netflix and hulu plus, amazon streaming and of course all the free channels. i pay less than $20 a month and unlike directv, there's always something i want to watch available. I cut cable TV for a year and never looked back. I am getting OTA digital signal, which satisfy my 'basic' TV needs. I also have Netflix, for streaming and 1 dvd at a time. My family also gave me a Roku box last year, which has a lot of hidden channels (YouTube, HGTV!). I was also surprised about how much stuff Crackle offers. What is Crackle? is that only through the Roku box? Can you explain further? "Hidden fees?" Where are the fees hidden? BTW, I've forwarded a link to this article to https://redbox.custhelp.com/app/ask I asked them if there are indeed "hidden fees" with Redbox usage. I'll report their reply to you. I too love the Roku box. I purchased it 3 months ago and have never looked back. The hidden channels are definitely worth setting up. I am surprised no one has mentioned Ooma. I was able to also drop my phone line and run VoIp with this wonderful device! Check it out. I am going to run as much as I can and save as much as I can until we start being charged for the amount that we stream. So visit the Ooma website and save even more! Yes! I just cut my cable. And I feel so free. The first week was a bit lonely.....but now, without the huge bill...I am much, much happier! Thanks for posting this article. I was doing some of this anyway....but might explore other options..with the money I save now from my cable tv bill, maybe I can afford a new t.v. or the apple t.v. I know there are other options though. What about Google T.V.? or the Sony T.V.? any news or reviews on that? Great options, but once you start renting movies and tv shows online the costs can definitely add up. Though I will say that with cable comes on demand services. Yes they are very convenient, but almost too convenient. The cost to rent movies is high, but it's easy. Netflix and rental kiosks are much more financially prudent options. I spent about a year without cable when I was in grad school because the house I rented was about half a mile from the road and cable wasn't installed. And it was the best year I ever spent - more time thinking, reading, listening to sports on the radio. Great for your mind and spirit. Of course, now that we have cable the TV is on all the time, yuck! Thanks for all the great comments and extra ways to stay entertained without cable. I agree that the library is also an excellent way to save money and watch new and exciting content. I've heard of Roku, but I'm not familiar with it. Sounds like it's also a fantastic alternative. I own a boxee box, among other things, it streams netflix. Getting rid of cable, has saved me over 80 dollars a month. If I can't watch a show/movie on netflix, I can down load most shows/movies on the internet, and watch it through boxee. It has paid for itself in two and a half months. I don't regret getting rid of cable. Netflix is a good option because its subscription rate is cheaper compared to weekly trips to the cinema. The site has a lot of good titles in its catalogue. This is a great list of suggestions to reduce spending on video entertainment without giving up on much content. Often, when money gets tight, folks cut out the "luxury" expenses in favor of paying for the necessities, and entertainment usually takes a hit. These alternatives can save consumers up to $100 a month on entertainment expenses. I work at the mangomoney.com blog where we offer many money-saving tips you can apply to other areas of your life. Check out our "Cheap Fun" section for more inexpensive entertainment ideas! You forgot about Megavideo, and other file-hosting and video sites. I've watched several movies and TV shows online for free, with a good search term in Google and a few clicks. unfortunately until we switch to devices that allow us the "ala carte" option (Roku, Apple TV, etc...) we will remain institutionalized by these cable companies. My wife & I have had to sacrifice watching certain programming the day it airs. But we did a cost/benefit analysis of what we were paying for with "mass program" cable packages vs. pay for what we want to watch at a later date. I would suggest every family take a look at this option and help get rid of the channel surfing times. We were paying $180 after taxes for our cable/phone/internet package. Analysis #1: TV. We were watching TV an average of 1 hour a night (excluding sports programs on local networks). Analysis #2: Phone. We have unlimited plan cell phones. We had used an average of 200 minutes a month on the home phone "Triple Play" package from comcast. Anaysis #3: Internet. We were supposed to get 20 meg/ps according to comcast. In reality it was averaging 12-15 meg/ps. The good news was it has been reliable in our area which is key. So lets add this up. We changed to local channels (gives us about 10 channels worth flipping through), dropped the "Triple Play" land line and went with Magic Jack (Vonage is more expensive than MagicJack but better quality, still less expensive than comcast), and doubled our internet speed and within a month we were able to save the money to buy a Roku and Apple TV ($169 for both) and dropped our monthly bill from $180 to $72 (& that includes our Hulu plus and Netflix subscription) Trust me its worth an hour on the internet researching your options. Make a change, however small you think it is! Who do you get your internet through and what do you pay for that? Forget cable. While the Roku and Boxee boxes are great options if your main concern is quality. You can also just use a PS3 system with a media sever like tversity, and play all your movies and tv shows stored on your pc wirelessly to your TV. With the built in Netflix, and crackle (which is ad supported unless you upgrade, skip it still needs work.)Apps. You can still get new movies here as well. Then connect your PC either wirelessly or ethernet cable. Toggle between the two and go to free tv sites like JustinTV, Rentadrone.org, ITV, Hulu,etc. They have every channel, sporting event, News, even live cable channels, AMC, showtime, etc. All available streaming free online. I have not needed cable in months. You do sacrifice quality and some stations are not full HD mind you but nothing is perfect, in time it will be. But if quality and ease of use is most important to you. The Roku option is your best bet combined with Netflix and HULU plus. subscriptions. You won't miss cable and cut your bills in half. Apple TV Fan! Since they have started serving network cable channels as pay per consume I completely dumped our cable company. Note that most new or current tv shows run 1.99 to 2.99 per episode with season passes getting upwards of 29.99. it still does not compare with cable as far as value but for those concerned with being able to pay only for what you want to watch, it is great! definitely a step in the right direction. thanks for the article Mikey. Don't forget buying a gaming system like a Wii or xBox 360 Kinect. My family has so much fun with our Kinect. It is very interactive and I find it brings our whole family together to compete in a sport or dance together. Not having cable saves you not only money, but-- even more importantly-- your time! The library is another big alternative that came to me :) I'm glad that's been mentioned. And for fellow watchers of Downton Abbey, Season 2 is viewable totally free on pbs.org! I eliminated my dish network subscription over a year ago. I bought a $40 antennae for my roof and google TV. I pay 7.99 a month for netflix and everything else is free now! I get plenty of TV now. What about watching sports? My husband insists on his football. We also have the special NFL football programming because his favorite team is not the local one. Anyone know how to get NFL games online? great list - i love not giving money to the cable companies !!! i would love to drop my cable service - but i need something that is easy and straight forward enough for myself (not very tech savvy), my elderly father, and mentally disabled brother to use through our tvs. also, something that will be compatible to tivo, or can replace it. any suggestions as to what (if any) would be my best option. thanks. While I love some of these options for movies and TV shows, I mainly watch sports, especially during college football season. Is there something out there for sports too? I dont know if other cable tv providers do this ~ but Time Warner will discontinue service for one to six months . I think this was first meant for customers who were on extended vacations and leaves . If the cable box and hardware is kept with the possible intent of resuming service ~ there is a charge of about five dollars . Around a year and a half ago I decided to cancel cable due to a financial set back, and found myself overwhelmed by the amount of information on the topic. The problem is that most of the sites, services, and products out there only offer partial solutions or no solution at all. Hence the birth of KilltheCableBill. I am now saving around $100 a month and have more shows and movies than i have time to watch. Well, this works only in areas with high-speed Internet that is NOT pay-per-use. Which is all some of us in rural communities get. What about College football and NFL games? Please let me know if there is anything less expensive. Thanks. While I appreciate all the advice and comments; I'm looking for an alternative to Comcast(Im in a condo and they are all that is available) but am an avid sports fan so I still would like to get most of the ESPN channels, Fox Sports, and NBS, CBS, ABC. I don't care about renting movies but I do like to watch some TV shows. You are my savior. And to think I was about to buy cable again to watch football. We are considering cutting our cable. Has anyone tried Clear Tv antenna? I suggest the Amazon Fire TV. The menus are fast and it has Netflix, Amazon Prime Streaming free vidoes, the voice-search is awesome. I have Internet and phone through Comcast, as well as TV. Those who have cut cable TV, what do you do for Internet?